Did you get a Nintendo Switch over the holidays? Or maybe you've had one for awhile now but need some new games to play? Either way, you can load up with Nintendo-picked indie games (affectionately referred to as "Nindies") during the Nindies New Year Sale. It's going on now through January 15. The Switch is still relatively new - not even a year old yet! - so the pickings aren't as grand as on other systems, but you know what they say: quality over quantity. And in the case of this Nindies New Year Sale, there are definitely some quality games up for grabs. Here are just a few I've picked out as personal recommendations, though you can see the full list on the main sales page, or on your Switch itself. 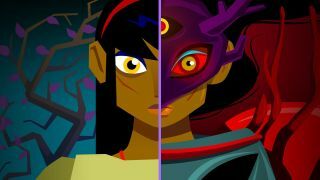 Severed for $9.99 (was $14.99): This stylish game from the makers of Guacamelee! is a first-person game about slicing and dicing monsters apart by using the console's touchscreen. Each fight is a bit of a miniature puzzle, and the art style is grotesque without being off-putting. It's also available on Vita, Wii U, 3DS, and iOS, so Switch is a natural fit. Lovers in a Dangerous Spacetime for $9.99 (was $14.99): As you might have guessed from the title, Lovers in a Dangerous Spacetime is a shooter set in space, best played with a friend - or three. Technically you can experience the game solo, but since each character fills a different role on your spaceship, it really is best with friends at your side. The Switch's pick-up-and-go nature and Joy-Cons make this a perfect match. Thumper for $13.39 (was $19.99): Described as a "rhythm violence" game, Thumper is unlike any music experience you've ever played. Speeding along winding tracks as a metallic beetle, you'll need to slide, grind, and boost in rhythm with hypnotic beats as trippy visuals fill the screen. There aren't any recognizable tunes to speak of, but the gameplay is so responsive and exciting you might not mind. But those are just a few suggestions. Be sure to check out the Nintendo deals page for more, and enjoy!